Smeg’s Vacuum Drawer combines high technical properties and an elegant design, and it can be used to seal solid and liquid foods in a highly efficient manner. The product can be totally integrated to Classica, Dolce Stil Novo and Linea collections, and uses a special technology to remove up to 99.9% of air automatically, compared to the traditional process, recorded through a special sensor. The Vacuum Drawer is made in stainless steel with a lid in tempered glass, combining resistance and aesthetics. The drawer is only 135 mm high, and the lid can be tipped to 65 degrees, making it more practical to use, and has self-blocking slides to avoid it closing inadvertently. The ample drawer capacity means that it can handle food in single and double portion sizes. 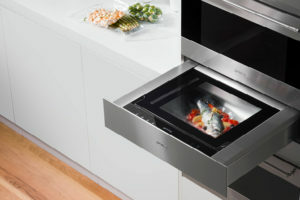 Another feature of the Vacuum Drawer is the option of 3 air aspiration levels: “delicate”, “medium” and “high”, plus the “chef” function for marinating and maturing foods. Bags are sealed, according to preferred intensity, in a two-stage phase, to prevent incomplete sealing. Smeg completes the product with a wide range of bags and containers to preserve and cook aliments, made from food safe polymers of the highest quality, PVC and BPA free.